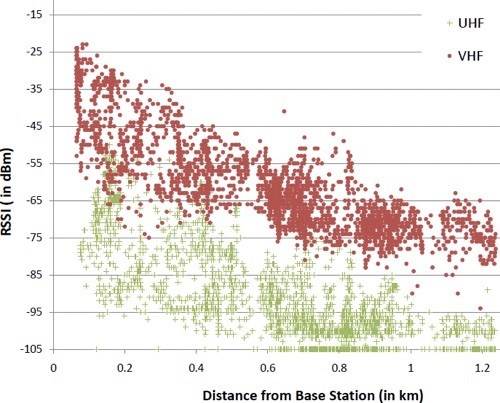 The graph at the right plots distance vs received signal strength (RSS) between a fixed base station and a mobile station that traveled along nearby streets in a suburban business park. The green UHF samples spread 40 dBm vertically, due in part to the topography between the two stations when the sample was taken. For distances under 1km, topography typically takes the form of treelines, buildings and other man-made structures. Over longer distances, it includes hills, ridges and valleys. The UHF band occupies 470 - 700MHz and overlaps cellular's MBS band. Its 40 dBm spread clearly shows that cellular site planning must consider topography along with distance and other factors. Free space path loss + horizontal and vertical 'aim back' antenna losses, using generic antenna patterns. Does NOT consider the effects of topography. Increasing the antenna height may reduce topographic interference. As the description above indicates, but doing so will not affect Best Sites' pathloss calculations. Pathloss computer models that consider topography compromise accuracy, sometimes significantly. Instead, Best Site can identify sites with no topographic obstructions and order them by a simpler but more accurate free space path loss model that ignores topography. Since, Best Sites found the sites with no topographic obstructions to begin with, its pathloss calculation can ignore this complex variable that is nearly impossible to factor into an accurate pathloss calculation. For more details about Best Sites and its new Automated Topographic Analysis feature, please see this article. In short, the power of Best Sites lies in its ability to instantly analyze the topography between the bullseye and all sites within 100km (potentially thousands) and discard those with topographic interference. Coverage data is updated monthly for Canada Cellular Services, and bi-weekly for Australia & New Zealand Cellular Services. This enhanced coverage is currently available only from Canada Cellular Services, produced from multiple data sources and offering better coverage than what is currently published by ISED or available from any other 3rd party. It turns red to warn you that the bullseye lies out of view, beyond the edge of the map. When red, the Find Best button still works as usual, but be aware that the search will start from a location not in view. You can make the bullseye reappear by panning the map in its direction (if you remember where it went), zooming out or simply clicking the Show Bullseye button, to place the bullseye back in the center of the map. For the past five years, Loxcel's Closest Sites feature has helped our subscribers find nearby cellular sites and assess surrounding topography. Over this period, Loxcel introduced many enhancements, such as aim back, smartphone access, topo preview, steepest peak, Fresnel zone, 3D Google Earth export, bullseye, foliage and overshot detection. Some items remain unchanged, like the filter options (Cellular), and the Show Bullseye button, which centers the bullseye on the map. Click Find Best to find sites near the bullseye and — this is the automated part — show only sites with favorable topography. Many selections in the new control panel remain unchanged (month/year, antenna height, foliage height, Fresnel percentage and overshot) but two are new: favorable topography (clear LoS) and rank-by (Path Loss). Clear Fresnel: show sites where the topography does not extend up into the Fresnel zone. Clear near-LOS is the least restrictive and will return more sites; Clear Fresnel is the most restrictive and will return fewer sites. These restrictions guarantee that if there is a site with favorable topography within 65 kilometers of the bullseye, it will now be shown! PathLoss: show sites with lowest path loss first. Notice that the expanded control panel's first row forms a complete English sentence, describing exactly what sites to find and in what order to show them: Find Best Cellular sites with clear Line-of-Sight from May 2018 ranked by Pathloss. Automated topographic analysis relies on over 1,000,000 megabytes of elevation data hosted locally on our servers. It is sourced from Natural Resources Canada, Geoscience Australia, and NASA's Shuttle Radar Topography Mission, a joint project of NASA, the German and Italian space agencies, and the National Geospatial-Intelligence Agency. 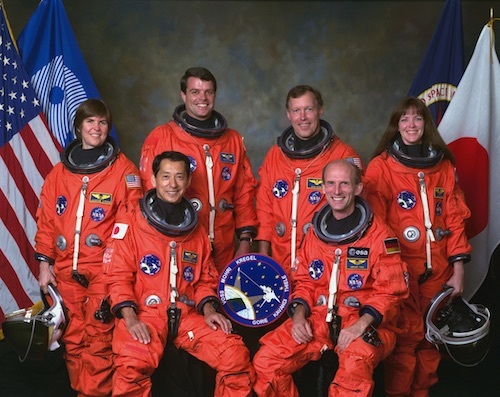 This mission flew aboard the Space Shuttle Endeavour in February 2000, mapping Earth's topography between 56° S and 60° N. During the 11-day mission, the crew (at right) used an imaging radar to map the surface of Earth numerous times from different perspectives. The combination of these radar data were processed at JPL to produce a global topographic map created by bouncing radar signals off Earth's surface and back to the shuttle. This radar did not penetrate dense vegetation, so the green topographic profile (shown below) follows the tops of dense vegetation and similar ground clutter. Our analysis also uses alternate ground-based elevation data to anchor cellular structures firmly on the ground, and to calculate antenna heights. Elevation data — even from NASA — is not 100% perfect, and cannot replace a physical site survey. Canada Cellular Services subscribers please note that automated topographic analysis currently supports searches below 61° N latitude. If you have any questions about Automated Topographic Analysis, please let us know.